By the Bronze Age in British Isles, and certainly in terms of the proto-historic Late Iron Age, we have what historians might call petty kings and aristocracy, sometimes with a more wider regional and national institutions. Although our museums have their weapons and treasures, architecturally, we have lost sight of the petty king in his palace and the homes of the aristocracy, always such a feature of our countryside. But this is just the tip of an iceberg of ignorance, since we know very little of the charcoal burner in his hut, and have no real notion of cart sheds or byres; only “roundhouses”, and, thousands upon thousands of uninterpreted postholes. It is this functional deficiency that I hope to explore in series of posts, since it represents a serious gap in our knowledge of an area fundamental to understanding any culture. One way of broadening thinking about function is to ask the question; what buildings does a moderately complex hierarchical agricultural society require? What’s the problem with our understanding of function? Roundhouses". 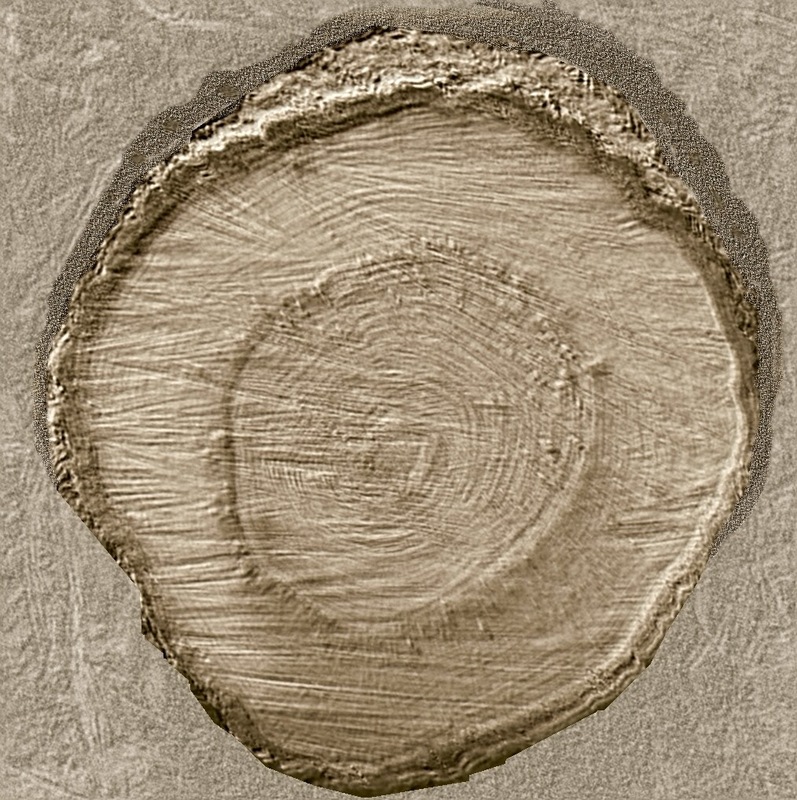 "; in recent posts I have pointed out that what we have accepted as unicellular single story structure with a fire at the centre is construct not supported by the excavated evidence. This is not to say that simple round huts did not exist, but circularity of design in the ground plan is a style, not a form. The passive acceptance of this idea and the exclusivity with which it has been applied to archaeological data has been a disaster to our understanding of Prehistory. The problems with roundhouses have arisen from reducing form to shape, and then assuming uniformity of domestic function. While I think we can take it for granted that most people lived in house, there was a wide variety of animals, materials, processes and social activities that required a building. In this post we are going to look briefly at the building needs of farmers, in particular housing their animals and crops. 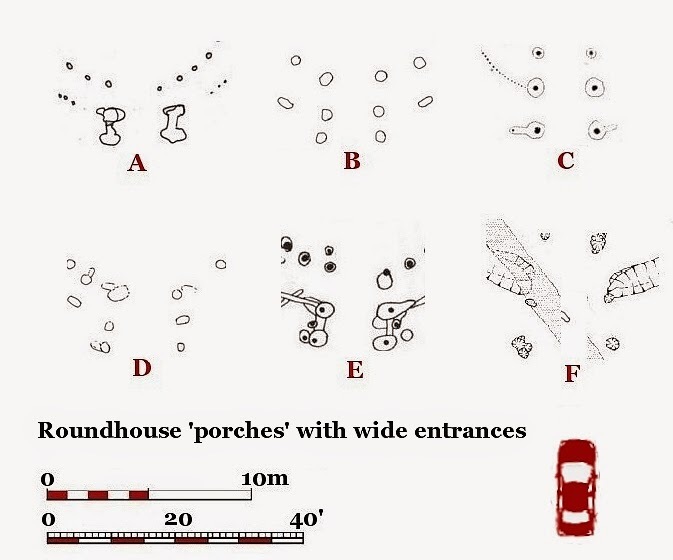 13 Key points to contextualise the origins of Prehistoric farm buildings in NW Europe. While this is a complex issue, agriculture seems to expanded into NW Europe as a frontier, gradually clearing suitable land in the major river valley systems; what business might call “organic growth”. For the LBK agriculturalists that spread north and west the Neolithic revolution was something that had happened a long time ago and far away. This was a fully-formed functional system of architecture; it was not transitional from living in caves or tents, and is not way related to what happened previously in these areas. Agricultural practices and buildings had a long time to adapt to the changing conditions for growing, processing and storing products, and the increasing need to house and feed animals during the winter. 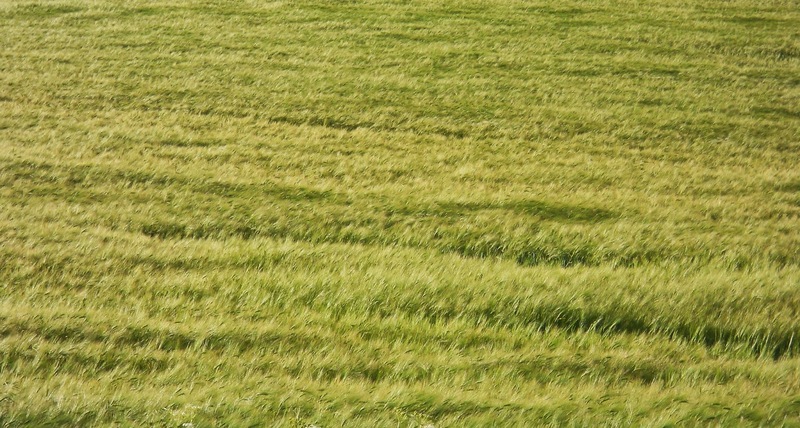 Farming in a cold, wet, and windy climate, which reduces the growing season, light levels and available dry days, is more dependent on buildings. High wind, wet, and snow are particularly deleterious to buildings. In temperate Europe there is an abundance of hardwood, particularly oak, and also a lack of serious wood eating pests like termites, allowing the development of robust long lasting timber framed buildings. The remains of Neolithic buildings from European lake side sites  were buildings with wooden floors and doors, and [like crannogs], demonstrate that hearths can be used in wooden floored buildings. While it is perhaps possible to grasp the concept and imitate aspects of agriculture, the same is not true of a complex technology like building that resides in the minds of individuals. The construction of buildings, spatial ordering and other agricultural engineering were probably the most specialised skill set of the Neolithic; farmland needs only to be laid out once, and farm houses should last a lifetime, these were not every day or seasonal skills. While ground stone woodworking tools are diagnostic, in a world largely fabricated from wood, it was what they produced that was of significance to Neolithic craftsmen, although this is largely invisible to the archaeologist. 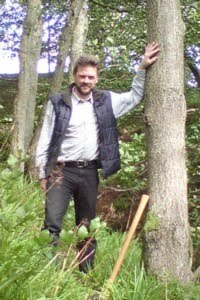 An important and easily overlooked aspect of the Neolithic skill set is woodland management which allows continuous production of woodland products, including long cycle [c.40-50 years] structural building timber. The initial uniformity and scale of LBK farmhouse architecture might suggest a degree of self-sufficiency within a cooperative environment; [Elsloo, Netherland. Left]. As always we have only a fragment of the picture, but as with seafaring cultures, the need for mutual aid and cooperation may have engendered a more egalitarian society among these agricultural pioneers. However, this is relative; there is no reason to suppose that the LBK did not use slaves, and my guess is that they would have enslaved, if not displaced or killed, the existing Mesolithic populations. I am not sure that the range LBK buildings are well enough understood to know how architecturally self-sufficient these large farm houses were, and if smaller subsidiary buildings were important. Scale maybe related to function, and not necessarily status. As already noted, by the time we get to the Bronze Age, there is a much more complex social differentiation and distribution of ownership to be reflected in architecture. While farming was the basis of the economy, and land ownership probably the basis of wealth, the individuals and institutions at the top of the food chain were not necessarily involved in the work of agriculture in any meaningful way. Further, we might also like to consider the difference between a Farmer and a Farm Labourer; on a pre-mechanised farm there is a much greater demand for labour than knowledge. Much of the daily and seasonal agricultural work is routine, and although working with animals requires skill, it does not require a high level of strategic decision making. However, concentration of agricultural wealth should be represented in the nature of farm buildings, with concentrations of larger and more specialised structures, perhaps in association with non-agricultural built environments. By the Bronze Age, the design of agricultural built environments has to accommodate two important new factors, wheeled transport and the widespread use of horses. Our traditional vision of a farm as a collection of buildings around a farmyard, is good starting point, but we also have to appreciate, that as a man made environment, a farm is system of enclosed spaces laid out in relation to topography aspect and soil, with due consideration of water supply and drainage. Hedges, fences, ditches and ponds, can be augmented using temporary structures like hurdles. The system is linked by a network infrastructure of tracks, gates and pens, with the farmyard and its buildings at the centre, their scale reflecting the various capacities of the associated land. Animals out-number people on farms, and if they have to housed, together with their feed, can take up a lot more room in terms of ground floor area. It should be borne in mind, that apart from the convenience and their own their own safety, we also need to enclose animals to stop them being stolen, a principle that extends to all agricultural products. While the traditional farmyard villain was the fox, in prehistory, wolves, eagles and bears were not yet extinct, although as today, rodents, birds, and insects are the farmers habitual enemy. Above and beyond the requirements of the humans, represented by things like houses, privies and woodsheds, there is a basic set of covered spaces that together constitute a basic set of farm buildings for mixed farm. 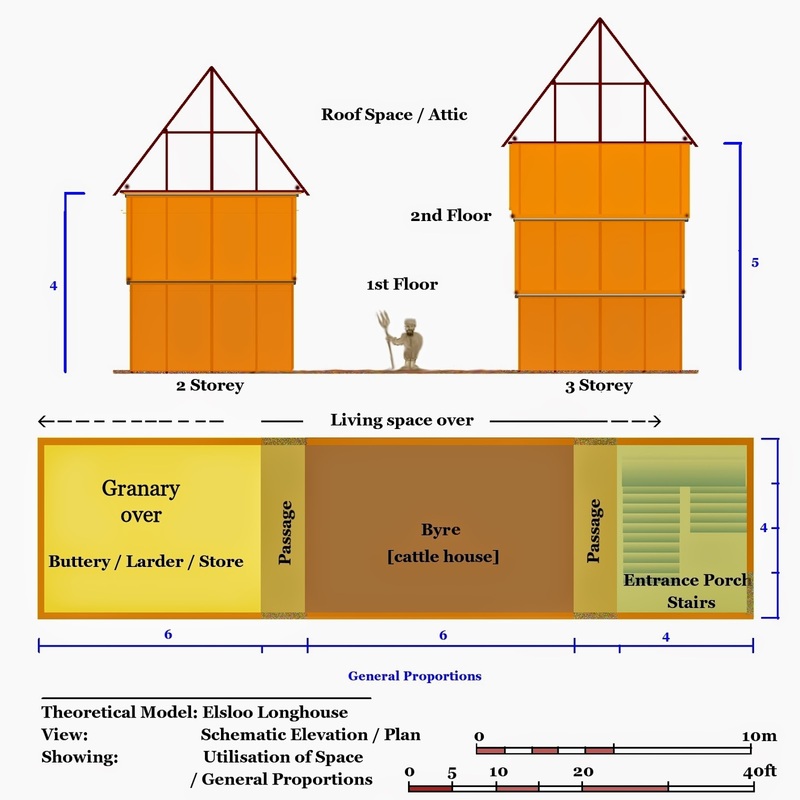 Spaces may be multipurpose or change their use depending on the season, and as the LBK longhouse illustrates, some can be combined with human accommodation within a single building. However, the specific form and function of each space is sufficiently unique for them to be considered as separate buildings. 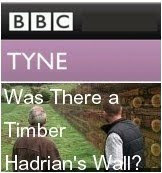 These are all spaces we should ideally be able to detect archaeologically on a regular basis.. Depending on local conditions, cattle may have to be kept indoors in severe winter weather, not only because there is no grass to eat in the fields, but also they could turn the churn pasture into mud. Even when animals are enclosed in the open, such as in a yard, in order to control, some form of [shelter] shed may be required to help dispense, protect and conserve the feed. Living over the cow house or byer is a good way of utilising the heat generated by the animals. Door only slightly wider than human. Pairs of Working Oxen are routinely kept indoors where they can be fed high energy food and handled more easily, similarly milking cows will need stalls. These buildings are characterised by a wide opening an adaption evident in any part of the farm that the cart may require access to. In general, the width, height and turning circle of wheeled vehicles should be reflected in the design and layout of built environments they use. Tall double doors are more complex to construct and hang, and should be firmly fixed even when open. Although the term is wisely misused, a barn is a building for processing cereals and the storage of products. 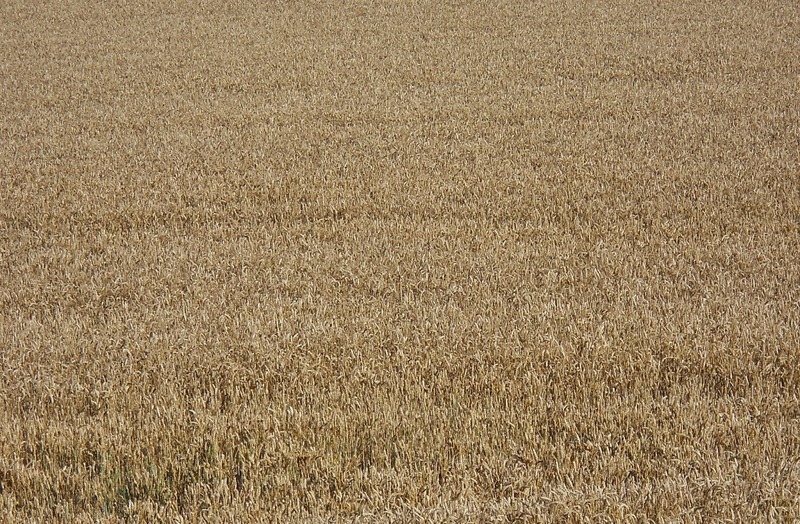 Once harvested, cereals have to be threshed to detach the grain from stalks [straw], and then winnowed to separate it from the lighter chaff. Typically, threshing was done with a flail on a special [threshing] floor and winnowing by tossing the grain in a draught using a basket, both activities are best done in a lofty space. The straw, the dried stalks of cereals, and hay, grass left to grow, cut down and dried in the sun,, can be can be satisfactorily stacked and covered without a building, but are probably better kept under cover. As with all bulk products storage close to where it is be used is preferable. Traditionally’ granaries are raised off the ground or on a second floor, which also helps secure them against vermin, and keeps the grain away from the ground. Grain has to dried before it can be stored, or it might rot or sprout; so spaces are required for processing and storage have to be dry. 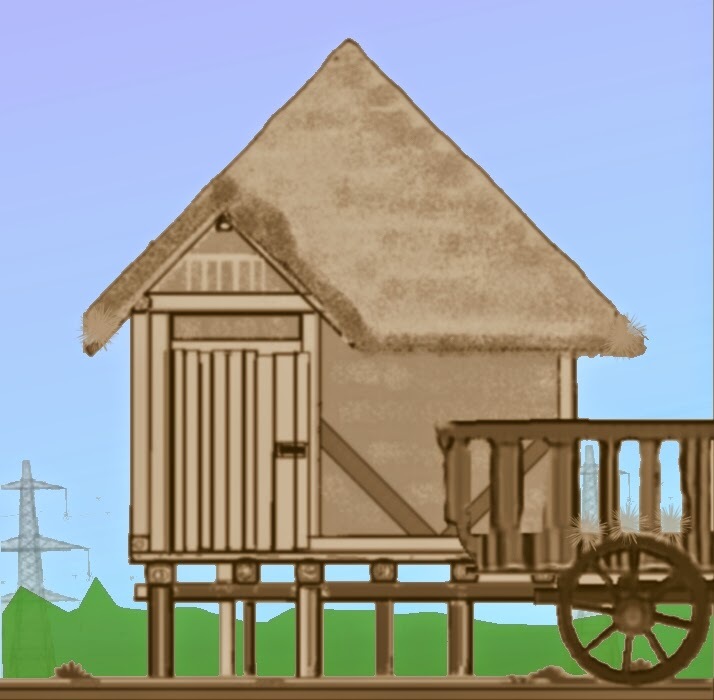 In addition, Grain is transported by wagon and is stored in sacks, in bins or loose, so the ergonomics are also served by a floor raised to the height of a cart or wagon floor. Grain was a valuable commodity. 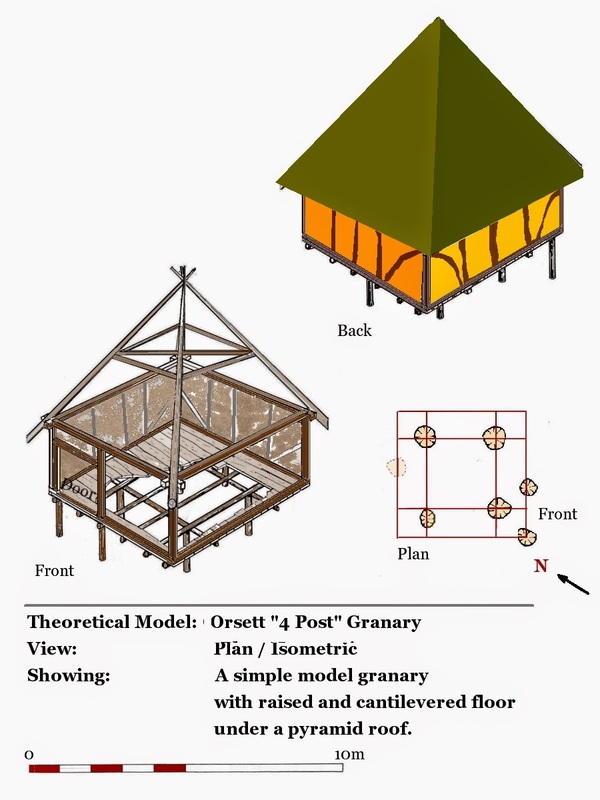 The "four-Post" granary, is one form of archaeological structure where function is apparently understood, and are another legacy of Bersu's Little Woodbury Excavation . I have sugested a cantilever design based on the evidence from the LIA site at Orsett, . I have always felt grain storage pits/silos, that are found in the Iron Age, are a feature of chalk as they not become waterlogged, but have only one great advantage over a granary, - they can be hidden. Individual Stalls / loose box format. Birds like Hens, Ducks, and Geese are kept for their eggs and meat, they should be housed or enclosed, [at least night], to protect them and for convenience of collecting eggs. 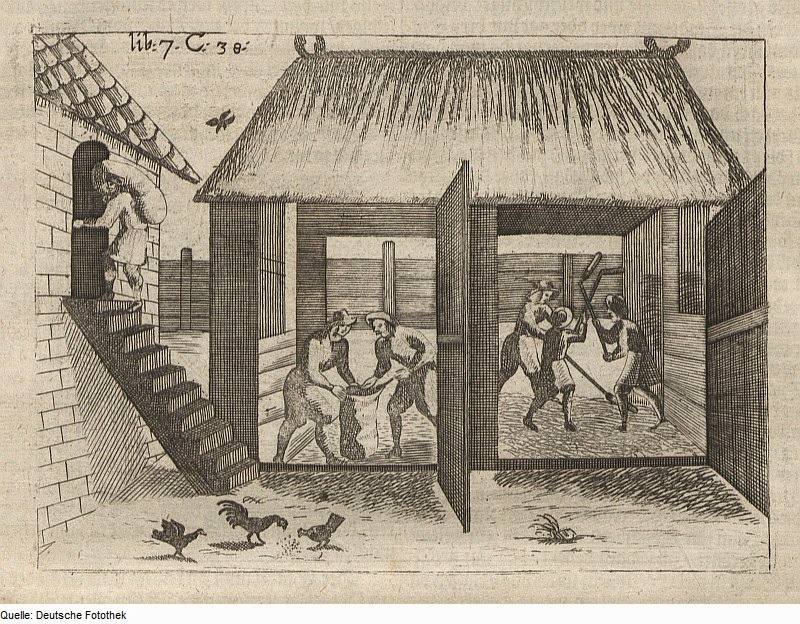 The design of the Henhouse is conditioned by the hen’s preference for roosting off the ground, and any attached run by the need to protect them from predation. The traditional pig style is a low building with an attached pen, troughs and water supply. Individual animals of any kind may require separating, perhaps when sick, and putting into a loose box, a flexible space to accommodate such eventualities. Sheep [and goats] are the hardiest of animals, but still need enclosure and protection, particularly during lambing when they are vulnerable. Unlike other domesticated species, sheep, and particularly ewes, don’t readily become accustomed to being handled. 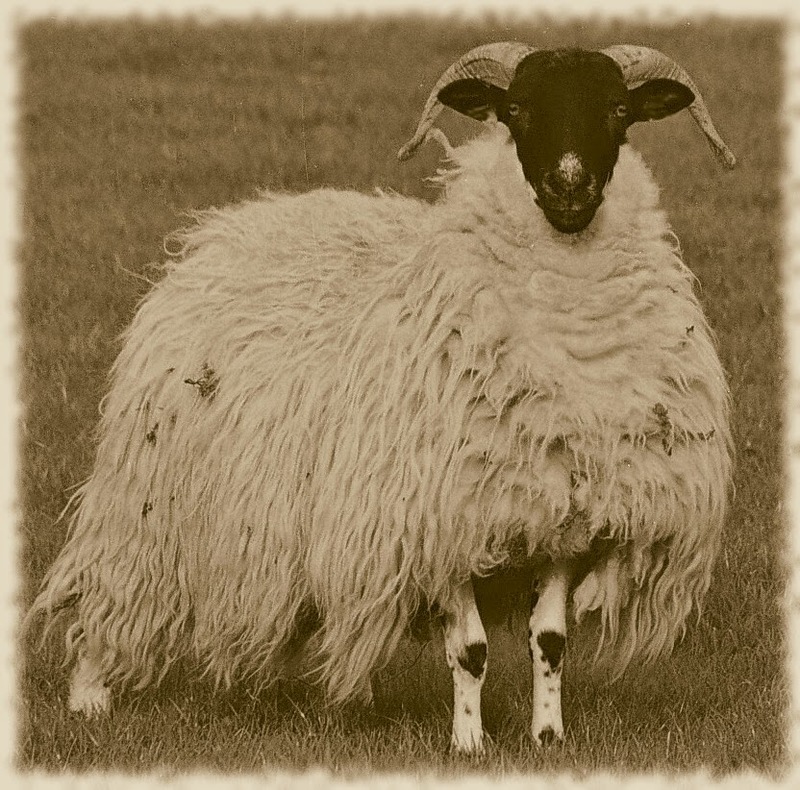 Depending on the regime individual sheep may require attention or separating into different groups; they will have to be sheared and their fleeces stored. There is a range of domestications evident by historical times such as ferrets, Birds of prey, even bees, but their ‘archaeology’ is somewhat obscure. Animals kept indoors require appropriate systems for storage and dispensing of water, feed and bedding, which are simple and practical to replenish. Disposal of wastes in its various forms is also a matter of real concern, but usually only visible to archaeology when drains are used inside a building. In many respects, the layout of animal accommodation is primarily to serve human needs. What becomes of the agricultural products for human consumption, the spaces needed for processing, storage and consumption relates to a different set of buildings that cater for the diverse needs of people is a separate topic. I have covered a range of theoretical buildings, any one of which would be a PhD research project in its own right, since in terms of British Prehistory you would be starting from ground zero. Such buildings are rarely alluded to in reports and they would have to be sought in the detail of excavation data. A methodology of reverse engineering structures from excavated data is only way conceivable way of developing a more nuanced understanding of both form and function in prehistoric build environments. However, for farmers, it is often the shared connective space, the yard/s, rather than the buildings that is often the focus of activity. For archaeology, the postholes and other features are the focus, but it is the nature of the spaces they define that is the key to understanding function, and it is their relationship to open areas that often gives context to farm buildings. PJR Modderman (1970): 'Linearbandkeramik aus Elsloo und Stein 2.' Tafelband, Leiden Univ., Faculty of Archaeology. 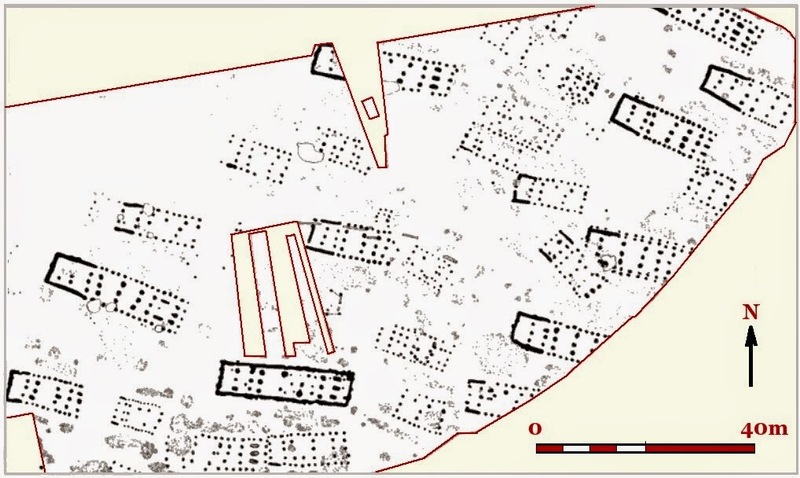 PJR Modderman (1975): 'Elsloo, a Neolithic farming community in the Netherlands,' in Bruce-Mitford, R L S, Recent archaeological excavations in Europe, Chapter IX. Do the groups of farm holes cluster in plausible villages or settlements related to geography and likely crop yields and distribution routes to the chiefs halls or towns? Hi, thanks for the comment, sorry to slow in responding [I was away]. Interesting point; this is complicated by the fact that are sample is limited, because a] this is archaeology, our data is fragile and easily destroyed; b] we tend to find failed farms/villages first - the successful ones are still there; c] Even when we find archaeology we fail to identify the buildings; d] and thus, without some understanding of Form, Function is irrelevant. As I will discuss, in a future post, geography is slow to change.
" that will make you into an overnight expert. Rather it is intended to plant some seeds of awareness that will hopefully save you from incurring unnecessary losses. In many situations..